This is huge. 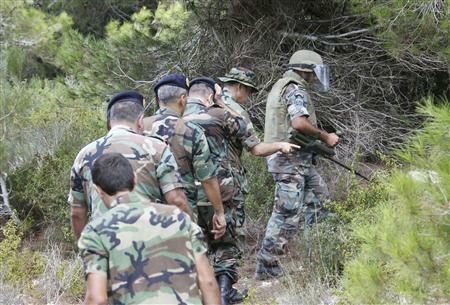 For the first time since 2006, Hezbollah responds to an Israeli aggression on Lebanese soil. There was the Ayoub plane, among many other confrontations, but nothing compares to the event of midnight Tuesday. And the very fact that an Israeli patrol got ambushed in Alma Al Shaeb by Hezbollah members only gets mentioned in details in Ibrahim Al-Amin’s Al-Akhbar article without getting the usual glorification of Hezbollah raises many questions. Hezbollah stayed silent on the issue, and even its media, Al-Manar, didn’t deny or confirm Al-Akhbar’s story but simply copied it on the website with a disclaimer that they are not responsible of the content of the article. This is Hezbollah’s salvation. The president is turning against them, Jumblatt is showing more hostility every day. The Caretaker Prime Minister felt abandoned by Hezbollah when the party didn’t nominate him for the premiership again, while the new PM has to form a government according to the wills of an anti-Hezbollah majority. Aoun’s drifting away from the March 8 Alliance, while Nabih Berri and Saad Hariri are flirting . And just when you think things couldn’t get worse, Bashar Al-Assad lost control on East Syria, Hezbollah is facing wide criticism over his role in the Syrian conflict, while diplomatically his military wing just became a terrorist organization in the EU. Even though Hezbollah’s still far from being politically dead – The governmental deadlock still shows the party’s political strength to veto decisions even if he can’t take them anymore – his silence on the issue is pretty weird. Such an Israeli intervention gives Hezbollah some of the legitimacy he lost after the Qusayr Battles. Nasrallah can go right now on TV and respond to Sleiman by telling him that the resistance is still needed and efficient, and the Alma events are the clear evidence . When the Ayoub drone was launched into Israel – While Hezbollah was in power and the Qusayr battles hadn’t even started – the party didn’t miss an occasion to remind us of the achievement even though he didn’t need lots of propaganda back then (compared to his status now). But when Israeli troops get intercepted in a Lebanese border town – At a moment Hezbollah needs a boost of popularity more than anything – the party chooses silence? Hezbollah stayed silent, but so did Israel. Hezbollah is facing diplomatic challenges with the new EU ban along with political and military setbacks in Lebanon and Syria. He can’t even risk opening another military front on the Israeli border, and that’s why he probably chose to stay silent in the aftermath of the ambush. The Israelis got his silent message, and there’s no need to make a big media issue out of it that might escalate things too quickly for a party already involved in battles hundred of Kilometers north of the Lebanese-Israeli border. Same goes for the Israelis. They don’t have time for diplomatic/military clashes: The Israelis are relaunching peace talks with Palestinians for the first time since 2010, and the last thing they want is being accused of an aggression against the Lebanese. For both Israel and Hezbollah, their clash is a clear violation of the 1701 resolution, because it indicates hezbollah’s presence south of the Litani and Israeli presence on the other side of the border. There’s a decent reason why the Israeli troops covertly entered 400 meters inside Lebanese territory. They might be planning a new attack, collecting intel, or even simply visiting a town to help boost the bad tourism season. But the most likely reason is that they want to take the pulse. 2013 is not 2006, and there’s a completely new and different situation in the Middle East. The Israelis are probably checking if Hezbollah’s still out there watching them and – in case he is out there – if he is ready to clash with them with the worsening of the Syrian war. Either Hezbollah has an informer on the Israeli side that told him about was happening that day, or it’s not the first time Israelis enter Lebanese territory in the same way – so they can be noticed the first few times by Hezbollah and see if he’ll clash with them – to make their test of Hezbollah’s readiness and presence. Sometimes silence is a virtue. Posted in Hezbollah, Israel, Lebanese Politics, Politics on August 10, 2013 by Ramez Dagher.